Lydia Gherghis played softball and was "the embodiment of the phrase 'full of life'"
A 10-year-old girl was killed Wednesday when a tree crashed through the roof over her bedroom. News4's Julie Carey reports. 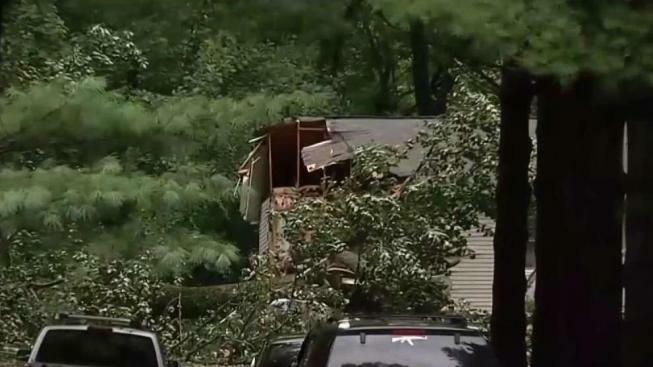 A 10-year-old girl who had just been tucked in for bed was killed when a tree crashed onto her bedroom Wednesday in Northern Virginia. Lydia Gherghis was preparing to start fifth grade. But a large tree fell onto her family's house in Warrenton during a thunderstorm. The 911 call came in about 10:25 p.m. Wednesday. A tree had fallen, trapping someone, the caller told the Fauquier County Sheriff's Office. Emergency crews rushed to the 6200 block of Highmeadow Place, off Route 29. "The tree had fallen through the roof, through the ceiling, onto the bed and pinned her. They tried, frantically, everything that they could, to try to free the victim and couldn't," Sgt. James Hartman said. A special tactical unit from nearby Prince William County had to stabilize the structure and tree so that they could remove Gherghis. The little girl was pronounced dead. Her distraught parents had to be escorted out of the house, for fear it would collapse. First responders, shaken by the call, took time to pay their respects as Gherghis' body was removed from the wreckage and driven away. "There was a tribute after the victim was removed from the house. The first responders lined the driveway as she was brought out," Hartman said somberly. Gherghis played softball and was "the embodiment of the phrase 'full of life,'" family friends wrote on a GoFundMe page they created for the family. "Her smile and laugh were contagious, and she always had a twinkle in her eyes," the page says. Gherghis attended Gravely Elementary School in Haymarket. Her mother is a school bus driver for the district, Prince William County Public Schools. Police are working to learn why the tree fell. Rain had been heavy, and the ground was saturated. Gherghis' family only moved into their house earlier this summer. Neighbors are mourning the family's loss. "My heart breaks, as a mom, for them to have to go through something like that," one woman said though tears. Go here to learn more about the fund for Gherghis' family.